It was only after I’d started making this coffee cake, mixing the butter and sugar, that I realized this wasn’t a round 9-inch cake sort of deal; this was a 13 X 9-inch beast. Yes, I know, you’re supposed to study a recipe carefully before proceeding; and yes, you’re supposed to butter the pan before you start (I tend to do it right before adding the batter). 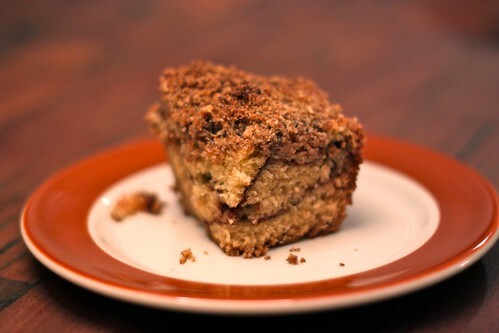 But the point is: I made a giant coffee cake. And the larger point is: it was so outrageously good, with a chocolate cinnamon swirl inside and pecans on top, that it was gone in a matter of days. Matt said the solution is to scatter blobs of batter on top of the cinnamon/sugar mixture and then to connect them with an off-set spatula. That’s good to know for next time! And there will be a next time. 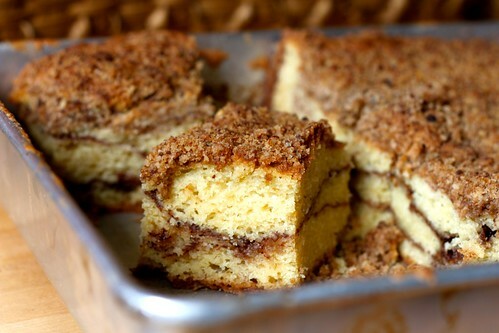 This is definitely a cake I’ll make again; perfect for breakfast, dessert or an afternoon snack. Here’s how you make it. …it’ll look like coarse sand. Cover with plastic wrap and store in the refrigerator. 2. To make the chocolate cinnamon swirl, simply whisk together the sugar, cocoa powder and cinnamon in a small bowl and set aside. 3. Preheat the oven to 350 degrees & butter a 9 X 13-inch baking pan. Sift the flour, baking powder, baking soda and salt together into a medium bowl. 4. 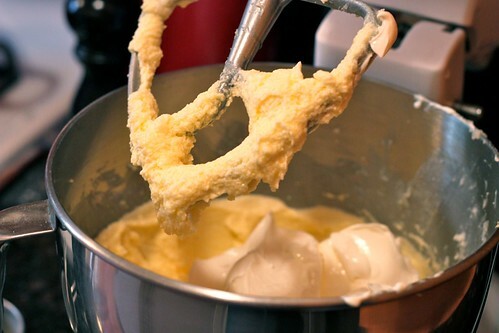 In the bowl of an electric mixer fitted with the paddle attachment, cream the butter until smooth and ribbonlike. Scrape down the bowl and add the sugar. 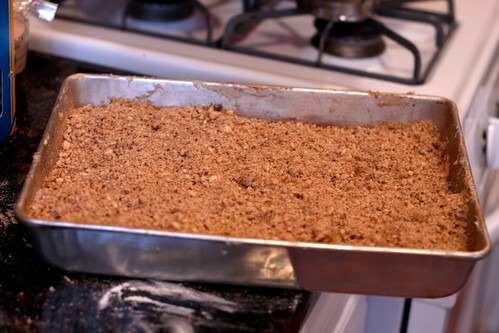 Beat until the mixture is smooth and starts to look fluffy. Add the eggs, one at a time, beating well after each addition. 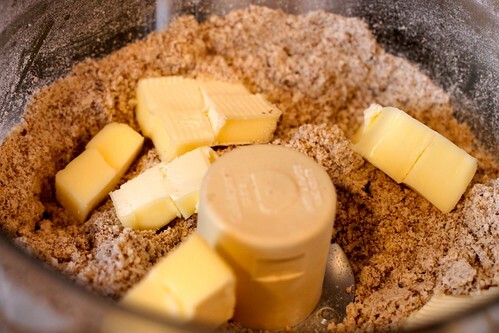 Scrape down the bowl and mix again for 30 seconds. 5. Add the sour cream and vanilla and beat just until incorporated. 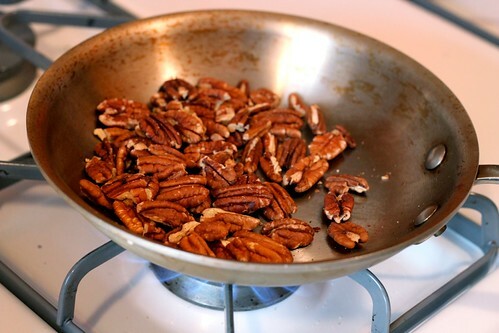 Add the dry ingredients in three additions, scraping down the bowl before each addition and beating only until each addition is just incorporated. Do not over mix. 6. 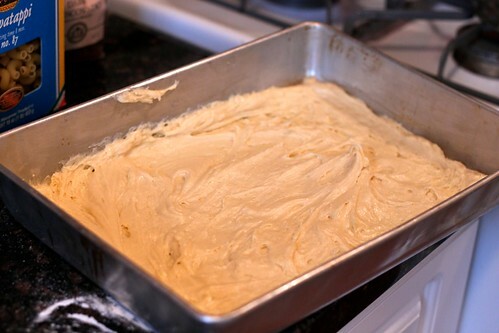 Pour one third of the cake batter into the prepared pan. Use an offset spatula to spread the batter evenly. 7. Sprinkle half the chocolate cinnamon swirl mixture over the batter, covering the entire surface of the batter. 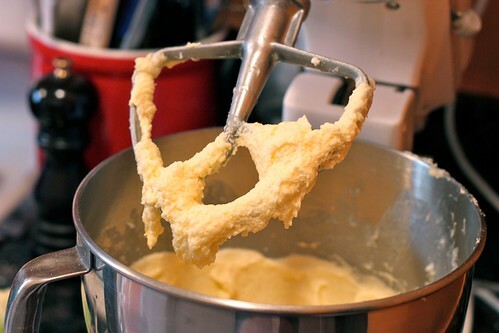 Spoon half of the remaining batter over the swirl mixture–do this in blobs, as Matt suggested–and spread it evenly. 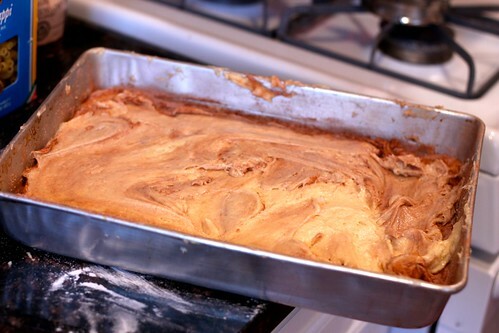 Top with the remaining swirl mixture, then the remaining batter, and spread the batter evenly. 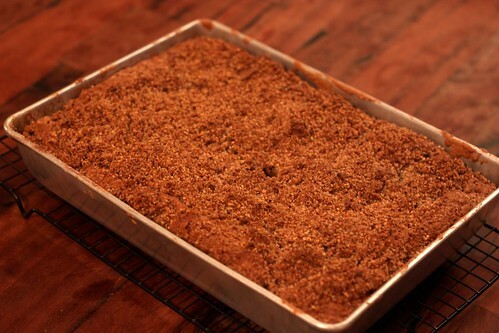 Sprinkle the crumb topping evenly over the top of the batter. 8. Bake in the center of the oven, rotating the pan three times during baking, for 1 hour, or until a toothpick inserted in the center of the cake comes out clean. 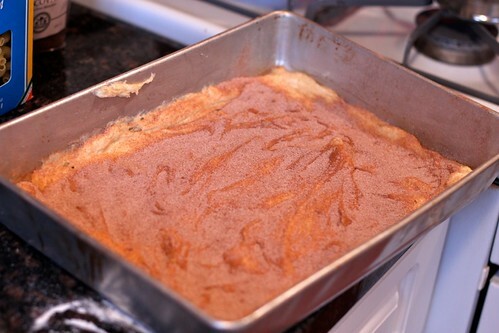 Let the cake cool in the pan on a wire rack for 30 minutes, then serve. The cake will keep for 3 days, tightly covered, at room temperature.